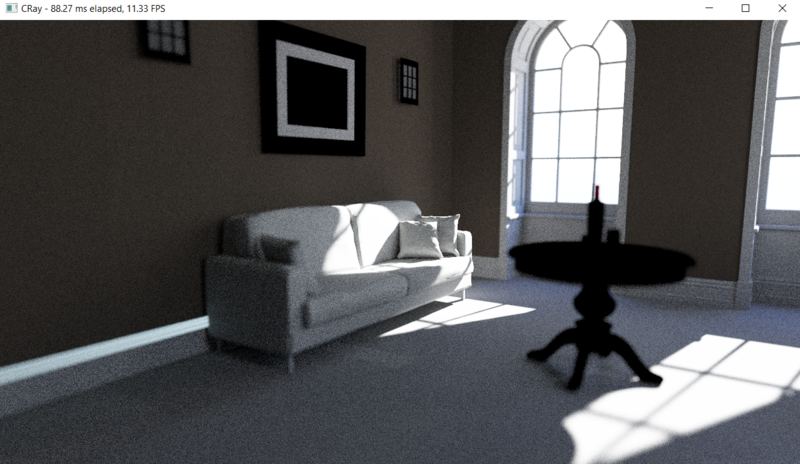 Path tracing has been known to be a very expensive computing task for many decades, but the level of realism it produces is simply astonishing. I want to push the limit of path tracing and see how fast it can become on modern hardware. 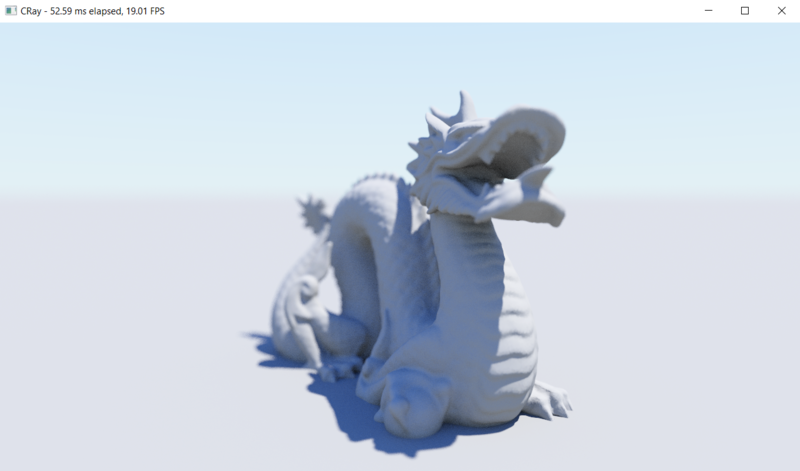 Currently CRay is able to render static scenes up to 1 million triangles at an interactive framerate (15 ~ 30 FPS) on a powerful GPU (for instance, an Nvidia GTX1060 would do) with a diffuse reflection model. Everything is implemented from scratch besides the UI. The rendering part is written in Direct3D 11 so it should be able to run on Windows 7 and onward. And sorry, no other platform other than Windows will be supported.
. 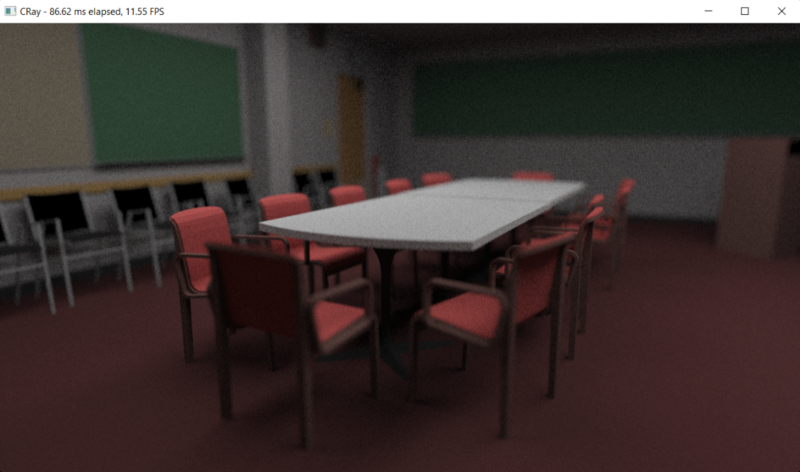 Faster rendering, hopefully achieving a much smoother frame rate.
. Higher quality images with the same amount of samples.
. A wider variety of reflection models. To make things run fast, I have the following plans in mind.
. 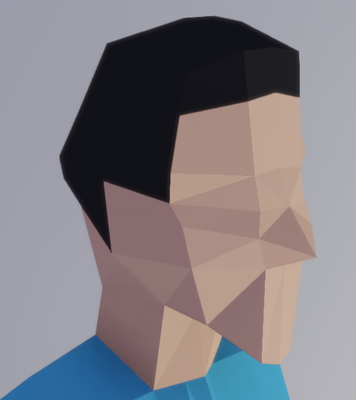 Improve compare various acceleration structures.
. Research and implement traversal algorithms that's well suited on the GPU.
. Pre-compute as much lighting as possible at a minimal loss of quality. If the short term results are promising, I will focus more on the dynamic side of things. Things like animated models and deformable meshes will all be in consideration to bring a truly interactive experience. If I can achieve the above, then I will consider pulling the whole thing out as a usable rendering library for people to use. First Demo is out! And a usage guide!